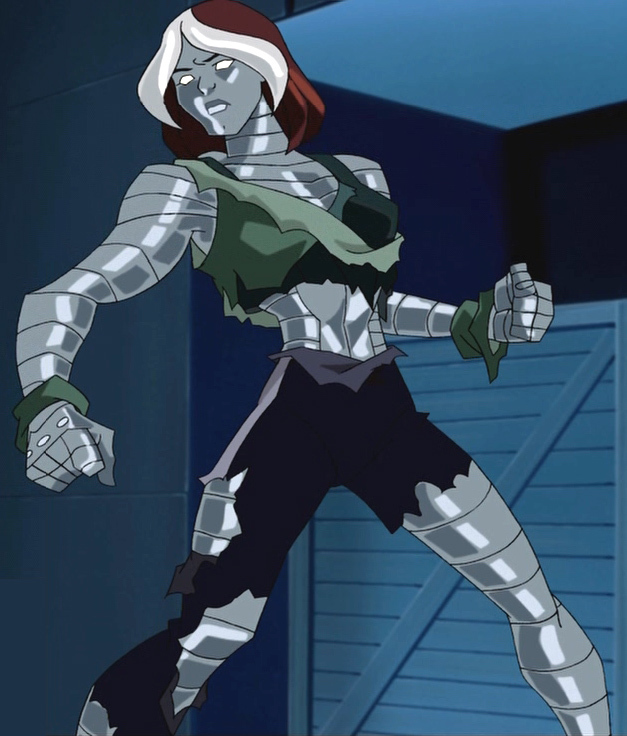 The X-Men: Evolution animated series is the primary focus of Kataclysm's X-Men: Evolution Page. Thousands of screenshots, hundreds of avatars, dozens of video clips, and many interesting trivia quizzes are featured here. 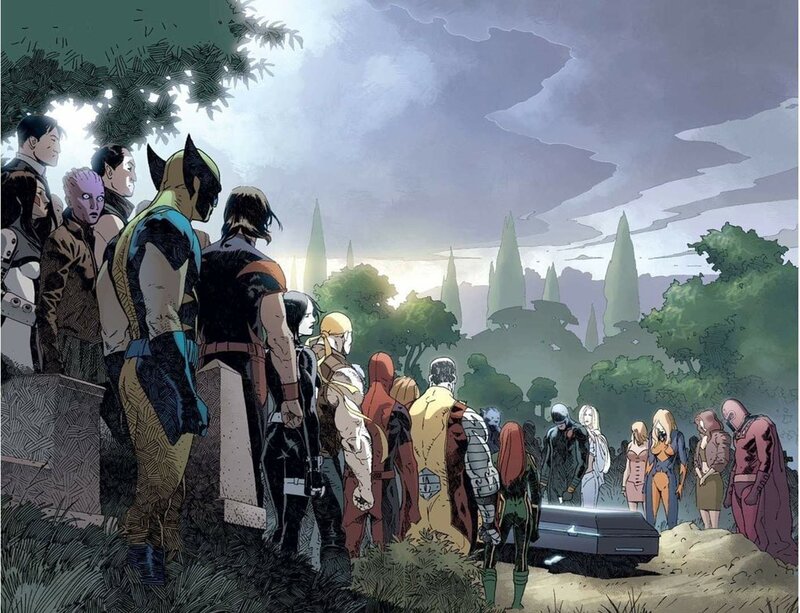 While the series may have ended Kataclysm's X-Men: Evolution Page continues to evolve with regular updates, an active forum, and feedback from enthusiastic X-Men: Evolution fans. Which X-Men: Evolution couple is your favorite? Let everyone know by voting in the latest poll. The Links page was updated today. Unfortunately more X-Men: Evolution sites have disappeared from the list including a few like Extreme Evolution which were very popular in the past. The newest poll asks what you believe could have kept X-Men: Evolution on the air longer, with the exception of changing the existing storylines. Earlier this year IGN ranked the Greatest Comic Book Cartoons Of All Time. It was a pleasant surprise to see X-Men: Evolution listed at #6. Another update...finally! The latest poll asks how much you liked the idea of the X-Men as teenagers. A video clip from "The Evolution Of The X-Men" feature on the "UnXpected Changes" DVD was added the Video Clips section (RealVideo WMV). If you haven't checked out The Art of Steven E. Gordon in the past few weeks you may want to take a look at the new X-Men: Evolution animation clips now on the site. A new poll is up today asking whether you felt X-Men: Evolution had too much, too little or just the right amount of action. Several more episodes now feature 600x450 screenshots. A new section called "Combined Screenshots" was added to the X-Attic which features X-Men: Evolution images created by combining several screenshots into one image. The Rogue picture is an example of three screenshots being used to create one large image. Two new videos are in the Video Clips section: Tales Of The X-Men (RealVideo WMV), and Stan Lee: The Original X-Man (RealVideo WMV). Screenshots of "Mutant Crush" and "Speed And Spyke" are also available in 600x450 format now. Kataclysm's X-Men: Evolution Page picked up the "Best Interactive Site" award at the X-Men Site Awards at Extreme Evolution, and I won in the "Best Webmaster/Webmistress" category. Thanks to everyone who voted! Steve Gordon is now selling autographed X-Men: Evolution Rogue posters for $10. You can read about it here. Mine arrived in the mail today. :-) The link also features Steve's answers to some common X-Men: Evolution questions (What would happen in Season 5, etc.). Three new videos were added today: The Art Of The X-Men (RealVideo WMV), Inside Xavier's Institute (RealVideo WMV), and Meet The New Mutants (RealVideo WMV). Steve Gordon is selling sketchbooks for $20 here on his website. Not only do the sketchbooks contain X-Men: Evolution drawings, but Steve has been taking requests for a custom sketch which he draws in the last page of the book. 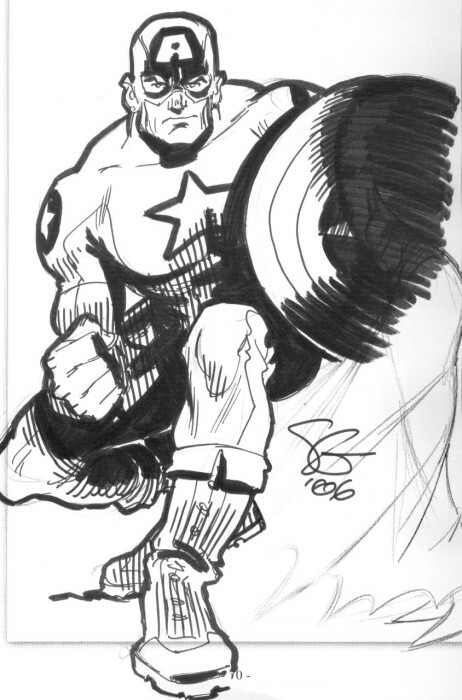 I didn't make any request for the first book I ordered and received a great Captain America sketch. 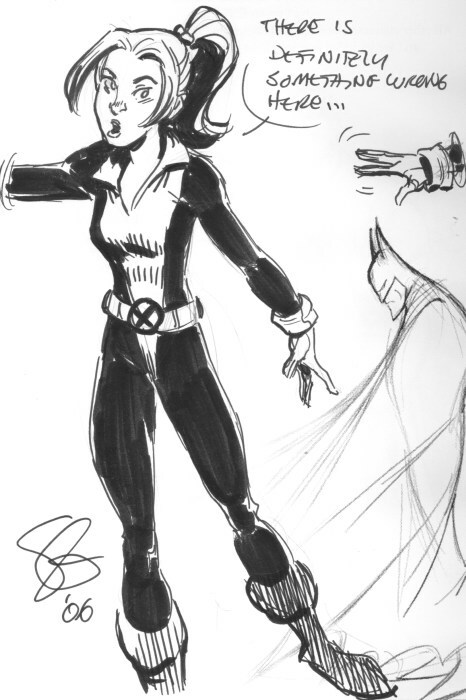 I requested and received a Shadowcat sketch in the second book I ordered. Click on either of the thumbnails on the right to see larger versions of these pictures. This Toon Zone thread has more sketchbook feedback. In my opinion it is a great buy for any fan of X-Men: Evolution or fans of Steve Gordon's other work. Extreme Evolution is hosting another round of X-Men Site Awards and voting is open (EDIT 8/13/06: now closed). Kataclysm's is nominated in a several categories again this season. Wolverine and Magma wallpapers were added today. New animated avatars of Magma and Professor X were also available. An Apocalypse wallpaper and an animated Shadowcat wallpaper were added today. The new poll asks which of the three X-Men movies you liked best. All Season 3 screenshots are now from DVD and are available in 600x450 resolution was well as the old 320x240 size. Many new screenshots were added to the Season 3 collection. "The Stuff Of Heroes" screenshots were converted to DVD format. Not only were the old screenshots converted but 29 new images were added as well. "The Stuff Of Heroes" and "Day Of Recovery" screenshots are also available in a larger 600x450 size in addition to the old 320x240 format. A new Scarlet Witch wallpaper is in the Wallpapers section. "Day Of Recovery" screenshots are now from DVD instead of TV. A Berzerker avatar was added to the Animated Avatars section. All videos are now in Windows Media Video (WMV) and RealVideo format. RealVideo clips from the last five episodes of Season 2 and all of Season 3 are now from DVD rather than TV recordings. A new video clip from the X-Men: Evolution Turning Point feature on the Mystique's Revenge DVD was also added today (RealVideo WMV). Season 4 videos are now in Windows Media Video (WMV) format as well as RealVideo. The "Magneto attacks Apocalypse" video from "Impact" and "Trouble at the zoo" video from "No Good Deed" are new additions to the Video Clips section. All of the Season 1 videos are now available in Windows Media Video (WMV) format as well as RealVideo. Videos from other seasons will be available in the WMV format in the future. All of the videos are in the Video Clips section. A few more video clips from the The Complete Third Season DVDs were added today. The first is a Gambit bio from the Cerebro's Mutant Files - Villains feature (RealVideo WMV). Next is a clip from the Season 3: X-Posed interview (RealVideo WMV). An advertisement for the Powers Revealed DVD was also added. All of these clips can also be found in the Video Clips section under the DVD heading. My X-Men: Evolution - The Complete Third Season DVDs have arrived! That should be good for at least a few site updates in the coming weeks. A description of the DVD set is in the DVD/VHS Video section. I made video clips of an included Enemies Unveiled advertisement in RealVideo and Windows Media formats. Ally sent this video as a thank you for Kataclysm's X-Men: Evolution Page. Very thoughtful don't you think? If you want to view the video right-click on the link and save it to your system. The file is almost 10MB in size so those without broadband may need close to an hour for the download to finish. I tweaked the website layout a bit. X-Men: Evolution RPG was added to the link list today as well. Today's new poll asks when you plan to see the upcoming movie X-Men: The Last Stand. New features were added to the Links section today. Columns can now be sorted in ascending or decending order by clicking on any underlined column heading. Many new links were added to the list as well. The X-Men: Evolution - The Complete Third Season is available for preorder at Amazon.com for only $13.99. Season 3 coming to DVD May 23! All X-Men: Evolution Season 3 episodes will be released on DVD May 23 for $19.98. Thanks goes to Comics Continuum for the info! You can read the complete X-MEN: EVOLUTION SEASON 3 DVD story here. TVShowsOnDVD.com also has additional information about the release. Update (3/2/06): The voting has ended. Kataclysm's won the "Best Content" category and picked up Honorable Mentions in three other categories! Thanks for voting! Shameless plug alert! :) Voting is now open in the X-Men Site Awards at Extreme Evolution. Kataclysm's is nominated in the Best Content, Best Interactive Site, Most Popular Site, Best Webmaster/Webmistress, and Fan Choice categories. To vote click on this X-Men Site Awards link or click on the button below. The latest poll asks which X-Men: Evolution character you think is the smartest. Twenty images were added to the Images section today including new images of Avalanche, Rogue, Shadowcat, Nightcrawler, Cyclops, Jean Grey, Storm, Mystique, Magneto, Toad and others. Eight standard avatars were added here today along with one animated avatar of Multiple and Boom Boom here. Kataclysm's is proud to receive the "Best Overall Site" and "Best X-Men Images" awards from the X-Men Site Awards at Extreme Evolution. Today's new poll asks "Which is your favorite X-Men: Evolution team?" Kataclysm's now has the pleasure of hosting Self Possessed which is an entertaining site dedicated to Evo Rogue. Burger King offered some interesting X-Men: Evolution toys in their kids' meals shortly after X-Men: Evolution began airing on TV. Each kids' meal included an action figure and mini-CD. I added a section about the X-Men: Evolution Burger King toys in the X-Attic. I also reviewed and updated all of the links in the Links section. The "Funniest X-Men: Evolution Character" poll was added today. Cryptic Darkness has relocated and is now hosted by Kataclysm's. Anyone interested in X-Men: Evolution, and Rogue in particular, should check out this great site. Today 25 new additions were made to the Images section including images of Beast, Rogue, Quicksilver, Wolverine and several members of the Morlocks. For those who want to be on the record supporting X-Men: Evolution a long running "Save X-Men: Evolution!" petition is still here at PetitionOnline.com. So far 8,693 signatures have been collected. Today's new poll asks how many X-Men: Evolution DVDs you own. Hopefully we will see episodes from Season 3 and Season 4 released on DVD as well. Unfortunately I haven't heard of any release dates yet. Several pictures were added to the Images section today. Kataclysm's is pleased to welcome our first two affliliates: Extreme Evolution and Southern Shadow. A knowledgeable reader and avid Toad fan found an error in one of the trivia quizzes! Question #2 of Quiz #1 in the Apocalyptic (hardest) level listed the wrong episode as the answer. The error was corrected a few weeks ago. I thank all of you for your continued interest in X-Men: Evolution and this site. July will set another record for number of visitors in a month. We also set a daily record of 181 visits a couple weeks ago. The forum continues to grow and recently surpassed 100 registered members. An Images section was added today which includes X-Men: Evolution promotional pictures, style guides and other images. Today's new poll asks what rating you would give the entire X-Men: Evolution animated series. Many X-Men: Evolution sites were added to the Links list today. Several X-Men: Evolution promotional images are now in the X-Attic as well. The Links page was updated today with the addition of a few new sites. Descriptions and current status are now listed for each site as well. Another easy level trivia quiz is available. For those interested in creating X-Men: Evolution art The Art of Steven E. Gordon site features a guide to draw your favorite X-Men: Evolution characters.